compliance with the water rules enforced by the ACCC. 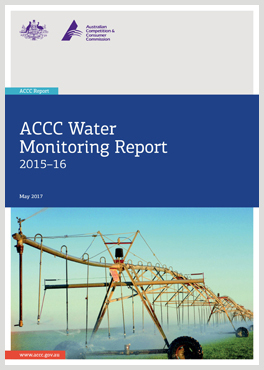 The report forms the key part of the ACCC’s monitoring and reporting obligations under the Water Act 2007. The ACCC invites stakeholders to submit any comments, feedback or questions on the report to the Water inbox: water@accc.gov.au. This technical guide accompanies the Water Monitoring Report 2015–16. It sets out: the ACCC’s approach to monitoring; the assumptions used for the calculation of hypothetical bills (including the schedule of charges for each operator included in the report); and the main WPM charges levied by Basin State governments and local water authorities. It also includes additional information which supports the analysis presented in the report.